Is Apple Losing Its “Rockstar” Status? Apple just had its biggest release of the year and no one seems to care. At Argus Insights we track markets , product launches, and companies to quantify how consumers feel about their products and brands. Over the past decade, Apple has been the darling of the public’s eye, but now seems to hardly be noticed after their biggest product release of the year. The evidence is in the data – demand for the new iPhone is MUCH lower than anticipated. 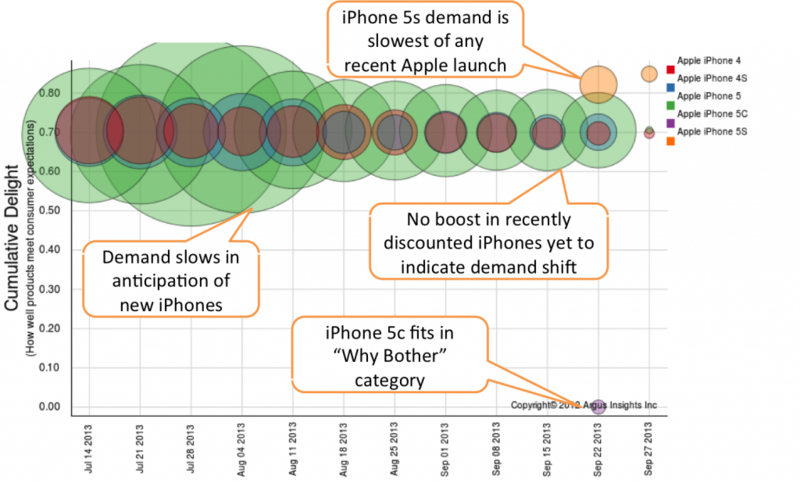 Analysis of consumer adoption metrics for the iPhone 5s and iPhone 5c may indicate a terrible launch for Apple in the US. Experience tells us that this market response to Apple’s launch is a dramatic disappointment for Apple. Although Apple claims they sold 9 million handsets within the first three days to “hungry markets,” our analysis indicates this “hunger” is outside the United States since the domestic demand is lagging. For the American market, such little chatter about Apple may be caused by the fact that the iPhone 5c is being mostly purchased by and for younger consumers, who do not show up as much in social media. The iPhone 5c receives much less buzz than the iPhone 5s. Given that social media use tends to skew towards younger consumers, this means the 5c is failing to capture the attention of the intended market. The social media data confirms that the iPhone 5s clearly has outperformed the iPhone 5c. By mapping comments to geolocations, Argus is able to decipher chatter coming from real people and separate it from chatter generated by corporate marketing sources. This reiterates the fact that actual humans are mostly silent on the topic of the Apple iPhone 5C. When looking at the social mentions of actual human beings, we see the iPhone 5c fade almost completely from conversation.